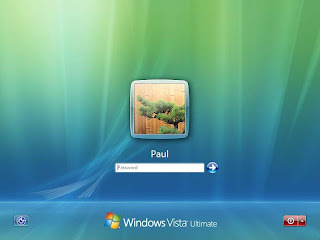 Windows will automatically show all user accounts on the welcome screen with no easy option to disable this. You may want to have a hidden one that no one knows about, and using this tutorial, you will learn how to hide a user account from the welcome screen. Click Read More to see how! This tutorial involves use of the registry editor. Do not do this if you are uncomfortable using it. First make the account you want to hide. If it is already there, you may skip this step. I will name mine "Secret". Next open the registry editor by pressing the Windows key + R on your keyboard at the same time. Type in "regedit" and press enter. If you are using vista, press the Continue button on the UAC popup. NT\CurrentVersion\Winlogon\SpecialAccounts\UserList". 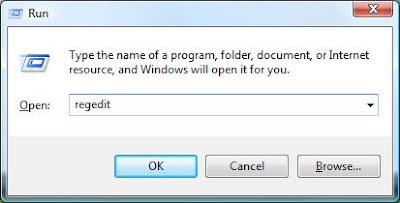 If the SpecialAccounts or UserList folder do not exist, create them by right clicking on the parent folder and creating a new Key. Make sure to name them exactly as they look above. Once in the UserList folder, right click in the white space and select new then DWORD value. Type in the name user account which you want to hide. This must match the user account exactly. 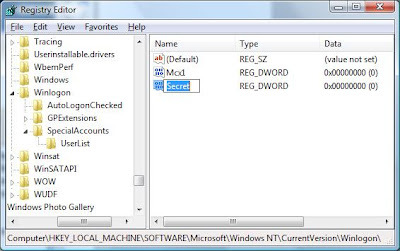 You can now close the registry editor, and the user account should be hidden! In Windows XP, you may press ctrl+alt+del twice quickly to bring up a login box where you can manually enter the username and password to log in.